Killer Characters: Making love, out of muffin at all... song titles and all that! Making love, out of muffin at all... song titles and all that! Lazy, hazy, crazy days of summer... why is it that summer seems to have so many songs about it? In The Summertime, Summer In The City, Summer of '69, Summer Lovin'. I guess growing up as a Wynter, I was always more aware of the summer songs. I had forgotten this, but when I was about 13 I had a friend named Summer; while we palled around and dreamed of being famous one day, we invented our imaginary group name, The Summer Wynter Girls. All summer we practiced out on the fire escape of my grandmother's Village apartment singing Belinda Carlisle's Heaven On Earth. Interesting sidenote: two of the top 100 songs that year were Endless Summer Nights by Richard Marx and Hazy Shade of Winter by the Bangles. Anyway... I went with her family to the Cape for a week that summer, but at the end of it, when we came back to the city and went back to school, something happened and we had a falling out. I don't remember what over. I think it was a boy. Isn't it often about a boy, in some form? Either you both like the same boy, or you get interested in a boy and stop spending time with your friend, or any number of other scenarios. How about you? 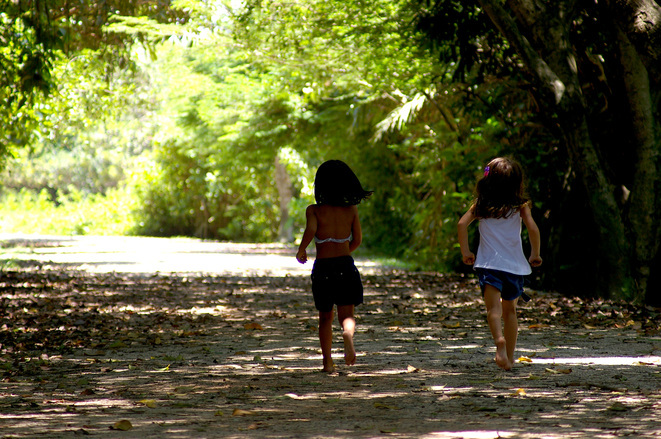 Did you ever have a summer friend you've lost track of? They say one’s home is one’s castle, but when it comes to Wynter Castle, Merry would like it to belong to someone else. But until a buyer bites, she could use some extra dough, so she decides to take in renters. The idea pans out, and Merry’s able to find a handful of tenants eager to live in a real castle. The only problem is most of them are crumby, tea-swilling old biddies. 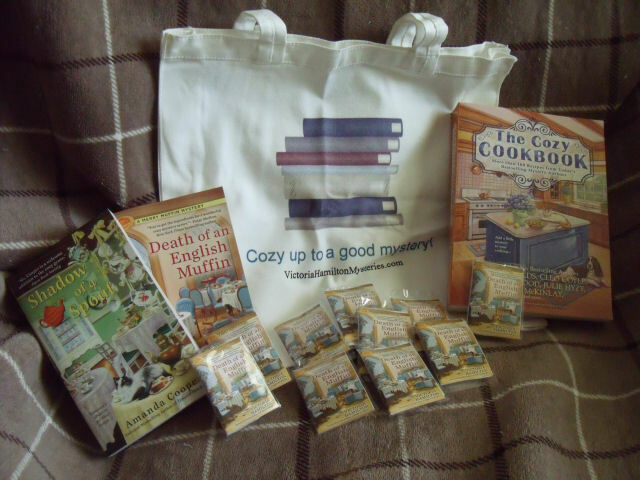 Comment here to enter to win a prize package including Shadow of a Spout (Teapot Collector Mysteries #2) Death of an English Muffin (Merry Muffin Myseries #3) and The Cozy Cookbook, as well as 10 special Death of an English Muffin teabags AND a Cozy Up To A Good Mystery! tote bag, suitable for all those summer reads! Include some form of your email address - eg: name (at) yourserver (dot) com. Prize is awarded as pictured. Open to Canadian and US entries! Comment by Midnight, July 21st, 2015! Oh wow! What an awesome giveaway!! :-) *does a little happy dance* Thank you for the wonderful opportunity. what a fantastic & generous giveaway!!! Thank you for a great giveaway!! This book sounds great. Amazing giveaway. Thanks for the chance! Nice giveaway thanks for chance. I love your books and look forward to reading these. Generous is the only word for this giveaway, I love it all. Thanks for the chance to win. What a fabulous contest and I can't wait to read both books! I never lost track of my best friend from summers in the small town we grew up in!! Even though she moved away we always kept in contact. In fact, she now lives in the small town where we spent our summers and we both work for the school in that town!! Wonderful giveaway. Just in time for my cruise. Hope I win.... lol.....along with everyone else. Yes, I lost track of a summer friend. It was a little boy named Warren. When we took my grandmother to see her relatives in VA each summer I played with Warren who lived across the street. We rode our bikes together down a hill in front of his yard and drank cold bottled coca-colas from my uncle's country store. I always wonder whatever happened to little Warren. Thx for the great giveaway opportunity. Wow. What an amazing giveaway. My email address is baxssbax@yahoo.com Thanks for such a generous giveaway. Great prize! And open to Canada! Happiest giveaway! Itsacatslife17 (at) Yahoo dot com. Awesome giveaway!!!!! Thanks for putting all of this together. The lucky winner will have hours of enjoyment!!! Cannot wait to read this one! Since I lived in a community of houses my friends were all year round. What a great prize. I love your merry muffin series and teapot collector mysteries. I own them on my kindle. I look forward to the new one's coming out. Keep writing and I will keep reading! Sounds like a great read! Thanks for the opportunity! Merry Wynter is a great chracter and loved Bran New Death! I never lost track of my best friends - I have a whole bookshelf full of them! Good one, D.A., and something I relate to. This is just a spectacular Giveaway, would love to win. I love mysteries & these sound like some great ones, thanks for this amazing chance. Email is lindamay4852@yahoo.com. Thanks again, Linda May. Thanks for the giveaway. I love to get goodies from an author. I have read a couple of your books and enjoyed them. Thank you so much for the opportunity! Would love to win this giveaway! I did lose track of a summer friend. She was living with her grandparents when we met but once school started she went back to her parents and never came back to the campground. What a wonderful giveaway ~ Love it! Looking forward to reading this book. Wonderful giveaway! I love your books! Okay, this is strange, I typed in a message clicked publish and it never showed up. I've lost many friends over the years through either their moving away or mine. It's a sad fact of life, although with FB and other social sights it's possible to track them down and maybe get back together. Love the package your giving away and would love to be the happy winner. Summer reads! Thanks for the opportunity! Mysteries involving teapots and muffins can't be any better. Friendships can be formed around a nice cup of tea. Tea, muffins and books. Just the right mixture for summer reading.. Thanks for the chance to win. What a great giveaway. I look forward to reading you newest book. Thank you. Oh, my goodness! What a giveaway!! 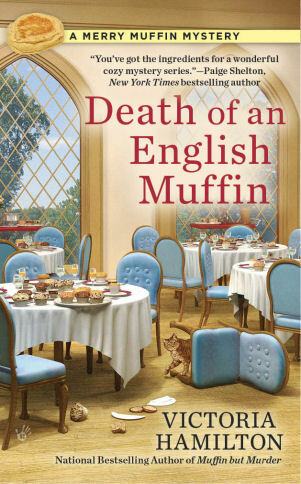 I have "Death of an English Muffin" on my nightstand right now. Congrats on the release and thank you for the chance to win all of these goodies! ~ Donna E. bwcottage (@) gmail (dot) com. Nice giveaway. Would loved to have it. Good luck everyone. Always enjoy new books and new authors. Thanks for the opportunity to enjoy your new books and "a spot of tea"! Lovely giveaway. I made English Muffins a few days ago and posted about my basenji boy's "addiction" to them - so much so that he stole one from the cooling rack. I posted about it and noted that "The Muffin Thief" would be a good title for a cozy mystery. Such an awesome giveaway! Love the title! Thank you for the opportunity! Books and great swag. Love it! Thank you for the giveaway. It sounds wonderful: tea and books. When you add pets to this equation, it is heaven on earth. nyilmaz365@yahoo.com. No I have never had a summer friend who I've lost track of. Thank you for the fabulous giveaway. I've lost track of all my childhood friends, but never because of a boy. I have had contact with a few high school friends, thanks to the internet. Great giveaway! Thank you. And wonderful books! Victoria, I love your books!! I gave one to my aunt and now we are both hooked. Thanks for the giveaway and great books! Love this series - and this giveaway! I can't wait to read the new book. I've lost track of lots of childhood friends, usually because I moved or we all went on to college and different lives in different places. In the case of one friendship that broke apart in elementary school, a boy brought us back together, at least sort of. Well, 2 boys. She stopped talking to me after her parents divorced. I never knew why. But a few years later in middle school, my (male) best friend and her friend/boyfriend were best buds, and they got us at least talking again, if not ever close. Hope this time I might have a real chance to win. What a great give away! I just purchased "Bran New Death" to read and am definitely look forward to reading some of your other titles. Awesome giveaway from one of my favorite authors! 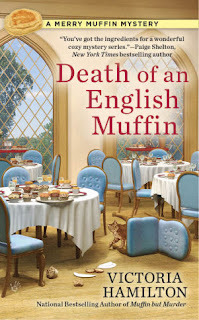 I'm looking forward to reading Death of an English Muffin. What a great giveaway. So many great books. This is a great series as are your other ones. Thanks for the chance to win. Would love to read this. thanks for the chance to win it. Would love to win this. Thanks so much for the chance. The Legion of Horrible Ladies - must read about them! Super giveaway from a super author. Oh WOW! What an awesome giveaway!!! Please enter me! Thanks for the chance to win some of your books. A big thank you for the tremendous giveaway. Love your books. Cool giveaway. Thanks for the chance. I love cozies. What a great prize package. Thanks for the giveaway opportunity. I lost track of a friend when she moved out of state. We were in touch for about a year, but the letter and phone calls decreased as time went on. Great giveaway. I want all 3 of those books. Thank you for this opportunity, Victoria!! It is appreciated! I look forward to reading your other series, as I love the muffin ones so much!!! Fingers crossed and best of luck to everyone!!! what a "cool" summer giveaway! Love the title and what a fun prize. Amazing giveaway!!!! I have never read any of your merry muffin mysteries, but I have read all of the vintage kitchen mysteries thus far. And the first one in the tea series. I read most of the authors that have recipes in the cozy cook book and would love to win. I love muffins and this is a fantastic giveaway. Thank you. Love the Muffin series. Facebook has given me the opportunity to connect with some long lost summer friends. Hello, all! The winner has been drawn using Random Number Generator: Rebecca at 9:14 AM. I have emailed her! I got an email from one of my newsletter subscribers who suggested that one day doesn't give enough time for everyone to enter. I think that is probably true, and in future I think I'll be doing a three day giveaway window! Thank you ALL for entering! I appreciate it so much. I love this series and am looking forward to reading it. It's next in line in my TBR list. Thanks for having this great giveaway!! What a nice giveaway. I so enjoy cozy mysteries and the humor that goes with it. Thanks for this opportunity. I bought Death of an English Muffin yesterday!! Can't wait to start it. The series is highly enjoyable ! Great Giveaway! I love cozy mysteries.